What Is an HDR File? A file with the HDR file extension is a High Dynamic Range Image file. Images of this type aren't generally distributed but instead edited and then saved to a different image format like TIFF. Geographic Information Systems (GIS) files that contain information on the format and layout of an ESRI BIL file (.BIL) are called ESRI BIL Header files, and also use the HDR file extension. They store information in the ASCII text format. HDR files can be opened with Adobe Photoshop, ACD Systems Canvas, HDRSoft Photomatix, and probably some other popular photo and graphics tools as well. If your HDR file isn't an image but is instead an ESRI BIL Header file, you can open it with ESRI ArcGIS, GDAL, or Blue Marble Geographics Global Mapper. If your file isn't opening with any of the programs mentioned, double-check that you're reading the file extension correctly. It's easy to confuse other formats like HDS (Parallels Desktop Hard Disk), HDP (HD Photo), and HDF (Hierarchical Data Format) with the HDR format. 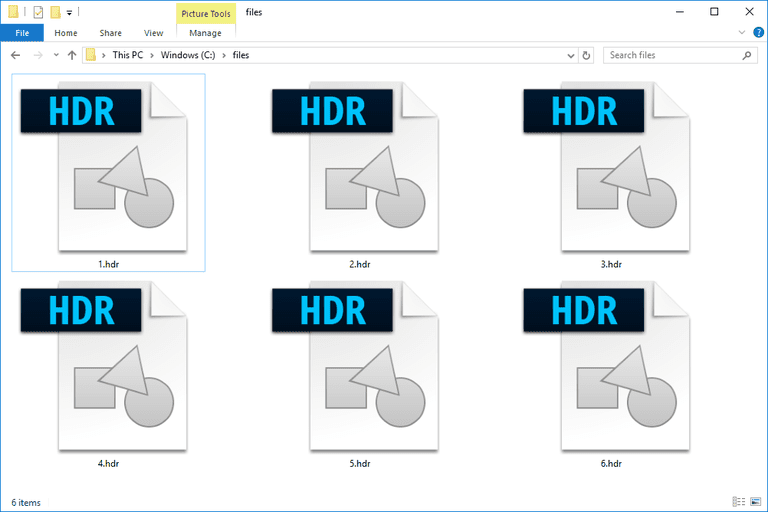 If you find that an application on your PC does try to open the HDR file but it's the wrong application or if you would rather have another installed program open HDR files, change the default program in Windows. Imagenator is one free file converter that can convert an .HDR file. It supports batch conversions between several image formats, including HDR, EXR, TGA, JPG, ICO, GIF, and PNG. You can also open the HDR file in one of the programs from above and then save it to a different image file format. If an ESRI BIL Header files can be converted to any other format, it's most likely accomplished through one of the programs linked to above. Typically, the option for converting a file in a program like one of those is available through the File > Save As menu or some type of Export option. If you need to convert HDR to cubemap, CubeMapGen may be what you need.